Former Flemington apprentices Oisin Murphy and Keiran Shoemark both saluted at the famed Royal Ascot meeting for the first time last night. Both Andrew Balding apprentices came out for seperate Australian summers on loan to trainer Flemington trainer Danny O'Brien. Murphy rode 13 winners in his stint here, including 6 in town, while Shoemark rode 9 winners in his stay. Murphy was in the winner's stall first when he piloted Benbatl to win the Hampton Court Stakes, after the pair finished 5th in the recent English Derby. 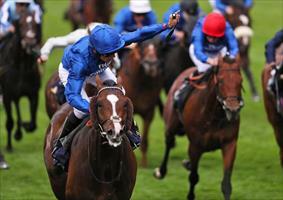 Murphy was animated in the saddle after passing the post as he claimed his first Royal Ascot winner. “I don’t celebrate very often, but that one meant the world to me,” said the jockey. “It builds up in your mind and you’re just trying to get it out of the way and the monkey off your back. It’s fantastic to do it," Murphy said. “He travelled like the best horse in the race because he was the best horse in the race. Then in the last on the card on Day 3 of the famed carnival, Atty Persse chalked up another landmark for Frankel as he became the stallion’s first Royal Ascot winner in the King George V Stakes, ridden by Kieran Shoemark, pictured winning here. Shoemark was thrilled with his win. “This really is what dreams are made of. This horse is all guts. He travels so well and he’s got such great character," he said.